I am an Instagram addict! I can spend hours and hours scrolling down and double tapping photos. I noticed, too, that a lot of online sellers are on Instagram and they are multiplying by the minute. Check out this article from Forbes.com: Instagram Is Shaping Up To Be The World’s Most Powerful Selling Tool So, being on Instagram seems to be working for retailers. 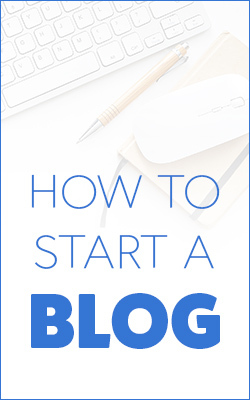 I met with Bam Besa, the author of this email sent to me, and she really captivated me with her impressive background and knowledge on the retailing industry. Her background is in Buying, Merchandise and Brand Management with 10 years worth of experience gained from working at a buying office and a luxury department store. She has handled categories such as ladies apparel, swimwear, fashion accessories and jewelry, undergarments and home decor. A few of the fashion brands I have handled are Swarovski, Elie Tahari, Jones New York, Vivienne Tam, Tadashi Shoji, French Connection and home brands like Pottery Barn, Williams Sonoma. Pretty impressive, right? Well, to cut the long story short, obviously, I partnered with her! Who wouldn’t? 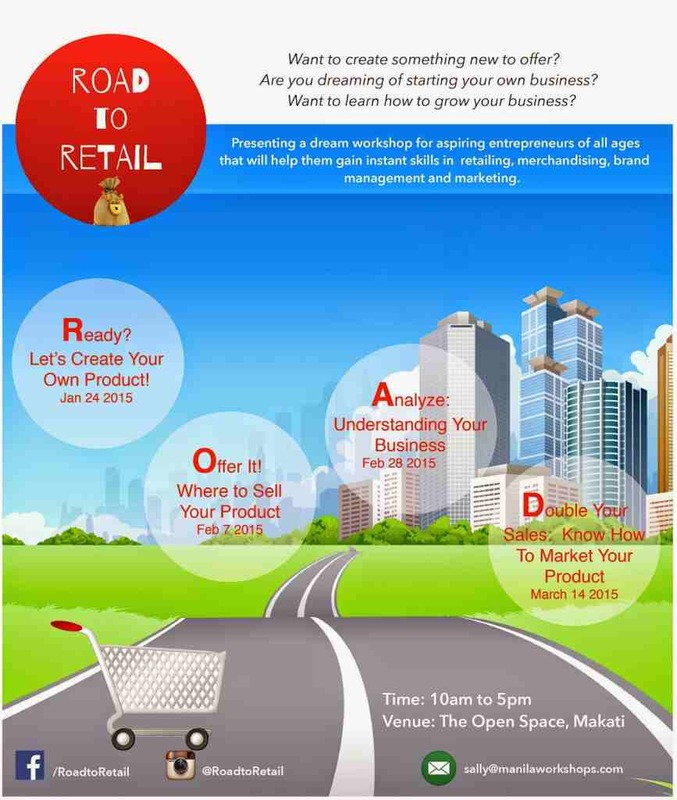 And so now, I’m presenting to you our baby, The Road to Retail Workshop Series. 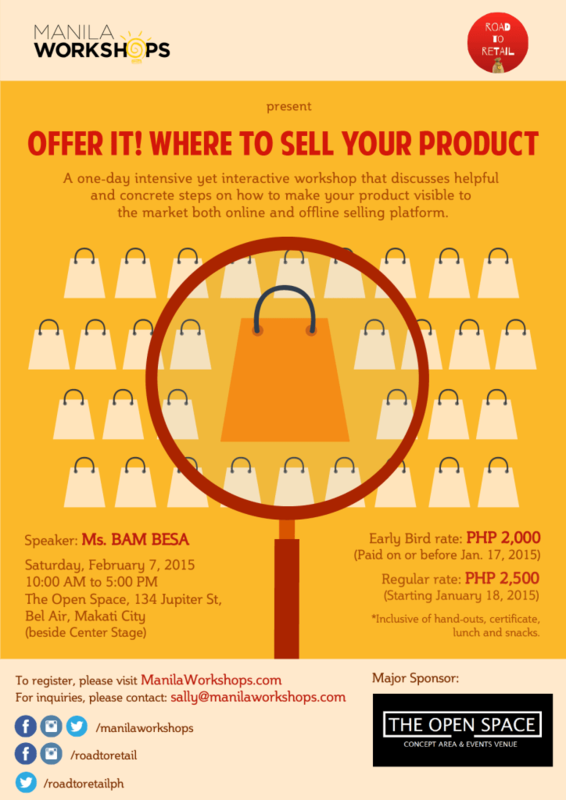 This is a series of valuable, practical and fun workshops under Manila Workshops designed to cater to professionals, business owners and aspiring entrepreneurs of all ages who want to learn about retailing, merchandising, brand management and marketing specifically of non-food products. The series is composed of four whole-day sessions beginning from product conceptualization to launching, selling and marketing, projecting and analyzing your business. – Those who wish to go into business but are unsure on how to proceed. – Those who like creating products or have an existing idea but need help in implementing them. – Individuals who dream of having their own store one day. – Existing entrepreneurs with online stores, whether sold via their website, Facebook, Instagram or other platforms. – SMEs who would like to learn more on how to better manage inventory and increase their sales and profitability. 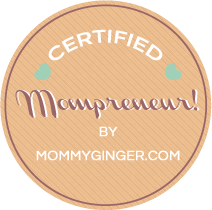 – Aspiring entrepreneurs who would like to know how to offer their products to major retailers. – Those who want to bring their business to the next level and expand their market. – Those without any business background and would like to take a short course on retail and merchandising. – Fresh graduates who want to go into the retail business. – Individuals who enjoy learning and would like to acquire valuable skills in the field of merchandising, branding and marketing. If you consider yourself to be part of this market, then hurry and sign up for the four courses. We offer discounts for those who will enroll for the four session. Just email sally(at)manilaworkshops(dot)com. 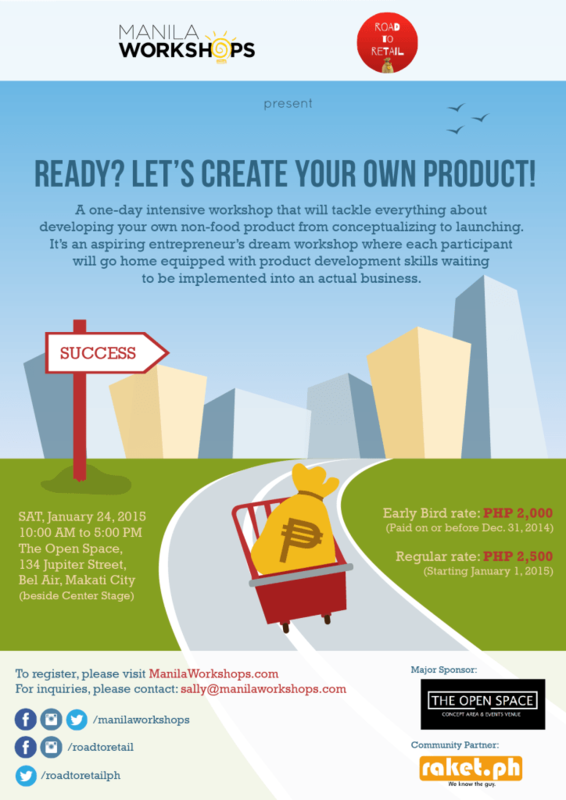 We have announced the first two workshops happening this January 24 and February 7. January 24: Ready? Let’s Create Your Own Product! We really hope that you can sign up! Allow us to help you get your game on this 2015! Previous Post Are you a Connector?